Whether it was collecting comics since I was about six or sitting glued in front of tv and theater screens transfixed by the exploits of everyone from George Reeves as Superman to Adam West’s perfect for kids tv portrayal of Batman to Robert Downey Jr.’s wisecracking imprint on Tony Stark and his famously metal-garbed alter ego, I’ve long had the superhero bug in my dna. The fictional examples of courage under fire that I could aspire to be like. The basic good versus evil theme. Or maybe it was just a desire to wear the cool costumes and scare the neighborhood bully off my scent. In any case, I’ve had a fascination with them that has plainly gone rabid over the years. The passion has only fanned the flames of my curiosity and questions. One such query seems to have burned in my mind over the years and I hope you will forgive my bringing it out here. If there was ever a universe-shattering situation which required the attention of all of the best of the best, big gun super-powered types (Superman, Thor, Iron Man, the Wonder Twins (ok, maybe they get left behind), who’d be left to keep the law and order end up on Earth? You’d think this job falls to the unsung, underappreciated, or even, dare I say, underrated enhanced gifts good Samaritan type. 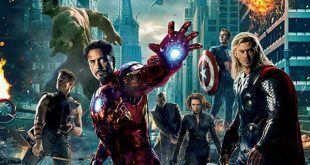 Like any good, rabid fan of the superhero genre you are no doubt fast into creating your own list of high-powered good guys and gals you would have step in at a moment’s notice. As you proceed with pen and paper apace, let me offer up my own selection of five super do-gooders that deserve a second chance to be called upon to carry the crime-stopping torch when the biggies are on assignment elsewhere. We shall briefly examine the merits of these folk through the movies that chronicled their stories. Similarly, we’ll touch on why the movies themselves are worth a repeat view in this critic’s opinion. 2011’s The Green Lantern is first up. Now, before the groan chorus starts on this Ryan Reynolds-starrer, I get the problems with the variable CGI effects, the clunkiness of plot (a lot of exposition thrown at you in the opening) etc. But, try as they might, these elements can’t take away from Reynolds’ fine performance (just the right charisma wattage and flip comic timing for this tongue-in-cheek caper) and a believable theme of shucking aside your selfishness and finding the courage and humanity to step up as a defender of your world. 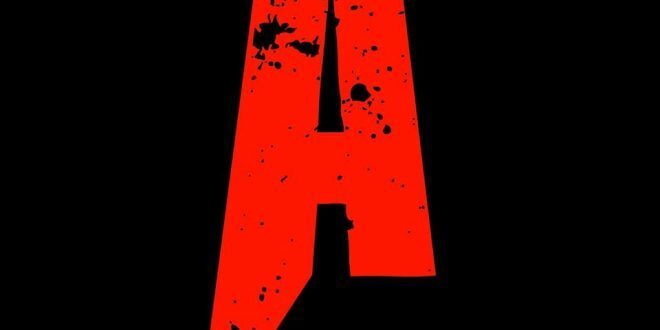 Plus the finale does have a corking badass energy and look to it. 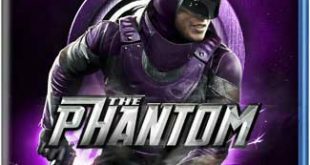 Next, we go back to 1996 and Simon Wincer’s The Phantom, based on Lee Falk’s comic strip that began in 1936. 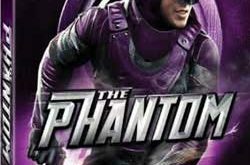 The interesting aspect of Kit Walker/The Phantom is that he is a hero who has no super powers and must use his intelligence, agility, and the reputation for immortality in battling villains. A lot of viewers were dismayed by this, their expectations of high-powered abilities with matching effects firmly taking root. Box office suffered rather significantly. There is a cool skull ring that he sports, and he’s accompanied by a trained wolf named Devil and a horse called, of all things, Hero. Of course, you may not call on him to beat Galactus but he is more than capable should local crime syndicates decide to loot while the Avengers and others take on the giant guy. 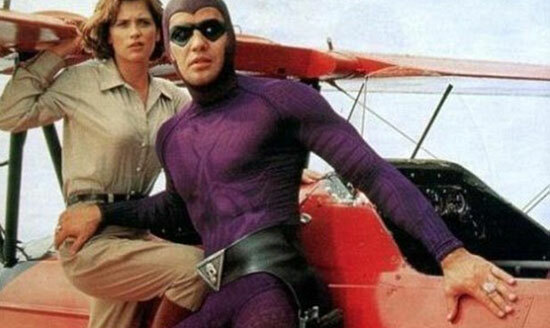 Billy Zane assays just the right solemn tone as Kit, and the purple costume simply dazzles. Treat Williams is perfect oil as the villain Drax. And there is plenty of action for the fisticuff-loving set. 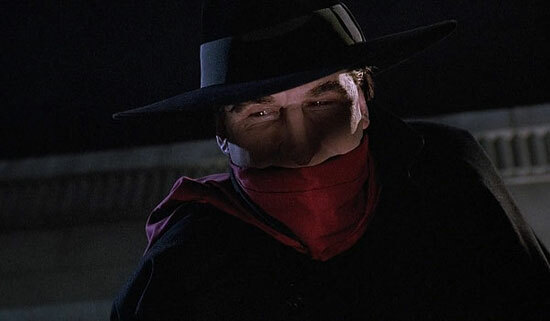 We go back a bit further to 1994 and Alec Baldwin’s stab at Walter Gibson’s beloved comic strip icon Lamont Cranston/alias the Shadow in the aptly-titled The Shadow. Baldwin was denigrated by critics such as Derek Adams of Time Out in 2006 for his performance being too low-key as to lack charisma. To me Baldwin balances just enough charm with the gritted teeth nature of the hero role to make it work plausibly. The showier part of the evil-doer Shiwan Khan rests nicely on the shoulders of John Lone, who’s got the lip-smacking villain down pat here. Yet the performances aren’t even the star for me. It’s the lush look of 1930s New York City that had my jaw agape. The Big Apple never looked so good. Now, like Kit Walker above, Cranston would not be used against heavy-hitting bad guys but his power to cloud people’s minds proves him more than capable to take on any of the more ordinary criminals who would seek to strike during a catastrophe. Flash forward to 2008 with Will Smith’s go around as the hero guy in Hancock. Well, of the alcoholic, gutter-dwelling and disillusioned variety anyway. 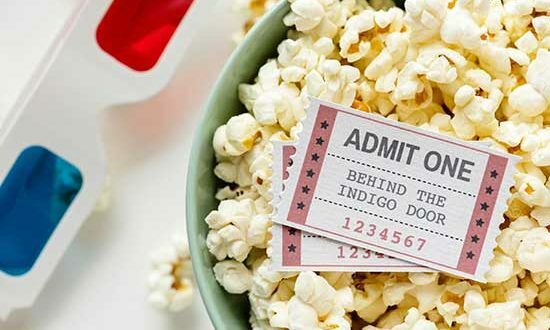 Rating 41 percent on the Tomatometer on Rotten Tomatoes, critics mainly had issues with the rapper-actor’s performance and the clumsy direction of Peter Berg. I bought into the contrasting turns of Smith as the bitter drunk and Jason Bateman as the symbol of hope. Getting Hancock to believe in himself and in fellow man just in time to save the world is an earnest formula that, while a bit worn, still works just fine. And there are some cracking action set-pieces that are just icing on the cake. As for what threats he can handle? I’d say any of the more earthbound super baddies left behind while the focus is on the scummy dudes at the end of the cosmos. For my final choice, I reach into my bag for the Dark Comics entry, 1999’s Mystery Men. 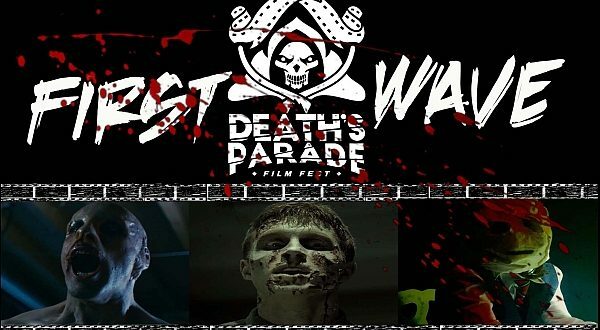 On the surface, it serves nicely as a hilarious spoof of superhero films, as a group of amateur heroes with odd abilities must band together to save Champion City’s resident hero, Captain Amazing, from his arch-enemy, Casanova Frankenstein. Beneath the surface, though, is a solid subtext about finding your place in your own world and being ok with it. And, yeah, there is the old working together as a team and finding courage angle that usually accompanies this material. 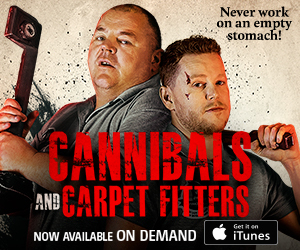 Critically, this film was savaged by not just fans and reviewers but even one of the actors appearing in it, Artie Lange. Lange, Big Red in the film, has often joked about the bad box office the movie had and considers it his worst film. This picture mixes side-splitting dialogue and humor (The Shoveller: “We’ve got a blind date with destiny… and it looks like she’s ordered the lobster.”) with solid action scenes to make for a good flick. Individually, this crew could only handle the low level crime scum. Together, they graduate to dealing with Green Goblin or the Lizard should it be necessary. When Thanos comes calling and the major super players speed off through the cosmos to defend us, you can rest assured that Green Lantern, the Shadow, the Phantom, a sober Hancock, Mr. Furious and his gang are on the crime-solving beat. Hooray for the underdogs! 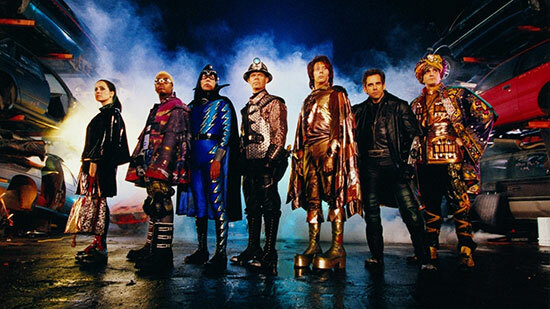 I very much enjoyed Mystery Men; it was a lot of fun. 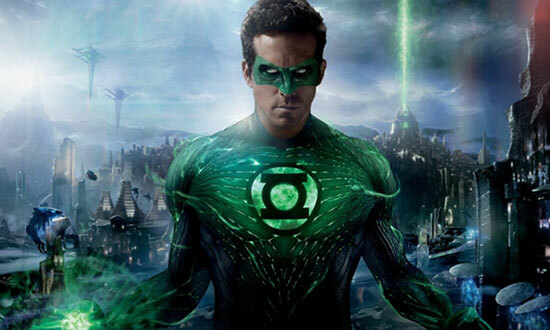 The Green Lantern movie was an epic disappointment. 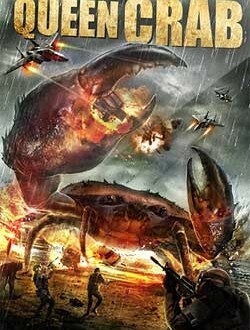 It took 0 risks and was such a generic formula film you could forget about it half a second after viewing. As a Green Lantern fan I feel the character (characters if we’re considering the corp) deserve a hell of a lot more. I would LOVE to see GL redone, bring back Reynolds but have him drummed out and Idris Elba brought in as John Stewart. When The Shadow came out, there was a critique done on EW which, unfortunately, can still be found on line. Owen Gleiberman makes the movie out to be a cheesy flick with bad acting all around. Such a poor, unimaginative brain at work, he cannot even get into the mood for some great entertainment. Not even worth responding with a comment. To date, have made it a point to never read anything written by Mr. Gleiberman. I absolutely loved Alec Baldwin in The Shadow and all the co-stars did a wonderful job including Jonathon Winters as the befuddled police commissioner. John Lone was amazing as the perfect protagonist. Comic book style – yes! Outstanding New York backdrops. 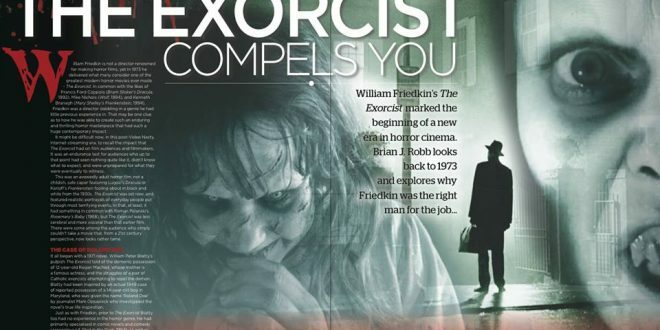 Bought it in VHS and then DVD as we still watch it today.